RRG - relative importance of RS-Momentum vs RS-Strength — s.c.a.n. (2) Slow-rising RS-Mom but near right of Improving quadrant (or left or Green quadrant). Is that the best strategy? (vs only buying stocks that actually cross into Green and selling stocks that cross out of Green)? Any performance (or even backtest) results anyone could share with 1 or other strategy? Let me start with stating that RRG is not a trading system with (fixed) trading rules! It is primarily a visualization tool that helps investors to be able or better be able to understand the big picture for any universe (stocks, sectors, currencies, etc.) they wish to analyze or monitor. Having said that and referring to your question. What is important on an RRG chart, or the interaction of the RRG-Lines when plotted on a price chart largely depends on the style and the goal of the investor. Someone with a longer-term investment horizon may be better off looking on weekly charts, to begin with, and then look for sectors or stocks that are in or close to crossing over into the leading quadrant as that indicates an established relative uptrend or the expectation that it will soon happen. It means that you are " late to the game, " but you have better odds for a follow through. Someone who is a very active trader looking for aggressive pair-trades may be interested in looking for securities to short inside the leading quadrant. Way on the outside, that are just starting to turn down, and offset them with securities that are inside the lagging quadrant and just started turning up. It is just a matter of taste and risk-appetite and not really different from how you treat your other, "normal" charts. Are you buying/selling when a stock breaks to 5-bar highs or to 50-bar highs or when it crosses a 5-day moving average or the 200-day moving average? With regard to back-testing that is a whole different issue and because of the nature of RRG (relative strength) a bit more complicated than a straightforward single-security test. To do it properly you will have to take a whole universe into account and also have "rules" on how to deal with issues on a portfolio level and not just on a stock/security level. From the research that we have done since introducing RRG, we have learned that securities that are turning into a 0-90 degree RRG-heading (like what you see on a compass) seems important and should be interpreted as positive. Now this can happen anywhere on the chart which makes RRG unique as it is something that can not be identified using regular indicators plotted on top of below a price chart. Although not a back-test as you may know it we have done "signal-tests" to get a handle on what-if? It was the main topic of my talk at ChartCon2016. If you had registered but were not able to see me I suggest you watch back my presentation on this subject. 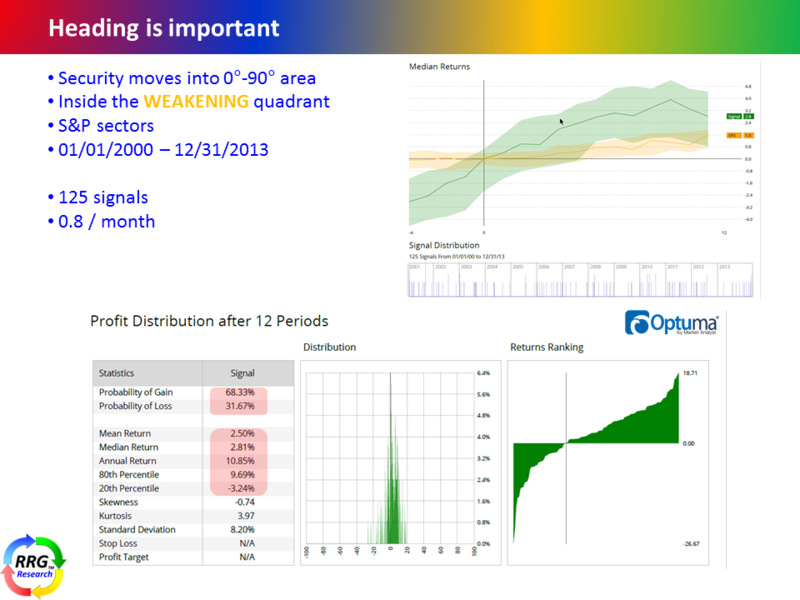 In case you have no access to the ChartCon videos I have copied two slides for you to review. They show the results for sectors, 12-weeks after turning to a 0-90 degree RRG-heading while they are inside the weakening quadrant. For all S&P-500 stocks it shows when a turn of RRG-heading into 0-90 degrees happens anywhere on the RRG-chart OUTSIDE the lagging quadrant. 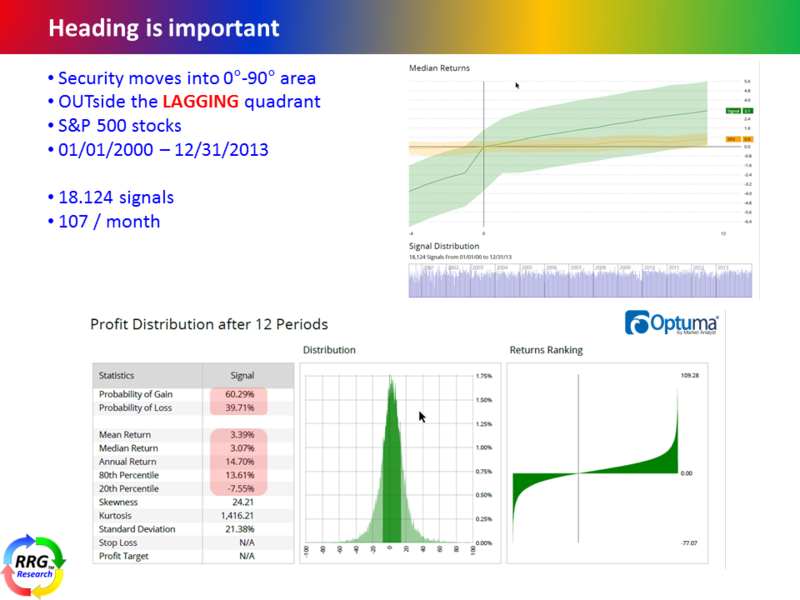 One clarification - what does "moving into 0-90 area in any quadrant" mean? Is it making a sharp clockwise turn? I confused 0-90 to mean the leading quadrant, but this seems to be a different signal, not marked in the RRG charts. Also, I don't seem to have ChartCon video access. Is this elaborated in any of your other blogs/youtube videos? - Great visualization tool, by the way. Any answer/response to my question above? Hi Kiran, sorry for the delay and missing your follow-up question. The 0-90 area refers to a compass with 0 being North and 90 degrees being East. With RRG-heading we refer to the "heading" or the direction of the tail on an RRG. RRG-headings can be read over multiple periods. For now, I am using only one period so the move/heading from (T-1) to (T). If that move points in an NE direction, or in other words "is heading into the 0-90 degree area" that seems to be a good thing from the research that we have done so far. Such a move can happen anywhere on the RRG chart. A security can be inside the lagging quadrant but turning into the 0-90 degree area. We are still working on this concept, other than the introduction at ChartCon there is no material available yet. Weekly vs daily RRG charts. Using the same time frame eg 4 weeks or 20 days, the resulting charts differ widely. Qustion why? and witch one is the most riable? ?